Steve Bates, Concertina, 2011. Photo: Thomas Kneubühler. Courtesy: Musée d’art contemporain. The Quebec Triennial is a massive act of triage by the curatorial team of the Musée d’art contemporain (Marie Fraser, Lesley Johnstone, Mark Lanctôt, François LeTourneux and Louise Simard) of the province’s artistic production [The Work Ahead of Us, October 7, 2011 – January 3, 2012]. Although he team’s travels were limited to the geographic boundaries of Quebec, a regional identity is not sought for, proposed or prerequisite. Instead, the curators limited the demographic to (mostly) thirty-somethings in an effort to define the prevailing ideas in this generation’s work. The result: a remarkably consistent exhibition that looks exactly as one would expect a contemporary art exhibition to look, just about anywhere. This is for better and for worse: it makes for an interesting show that demonstrates a high degree of professionalism: curatorial sparks, synapses of sorts, criss-cross the exhibition in every which way, lending intelligence to the selection without belabouring it into over-reaching “themes” or ideologically loaded “statements.” However, given the narrow channel through which (most of) these artists passed (one of Montreal’s two art programs), the professionalism that the artworks demonstrate is less exciting, nearing a new orthodoxy of post-Bourriaudian-production. The curators’ research discovered several recurring subtexts: a strong interest in the dynamic established with the viewer; a continued investigation into medium-specific perception; a reiteration of modern forms and ideals; and an extenuated, sometimes painful use of boredom and the banal. These rubrics are only tentative and, for many artworks, more than one applies. Their usefulness is limited to conveying the “feel” of this large sampling of Québécois art. The viewer, no longer a modern monad nor a postmodern subject nor a ‘90s collaborator, is now more of a target: the type and degree her participation is decided and demanded by the artwork, implicating her in its logic on its terms. In the case of the spectacular “interactive” light show by Rafael Lozano-Hemmer, Intersection articulée (2011), the logic is one re-appropriating control technologies for artistic ends: by way of a computer interface, the public activates powerful light beams more commonly used in border surveillance to make designs in the city’s night sky. Steve Bates’ Concertina (2011) also implicates the viewer. 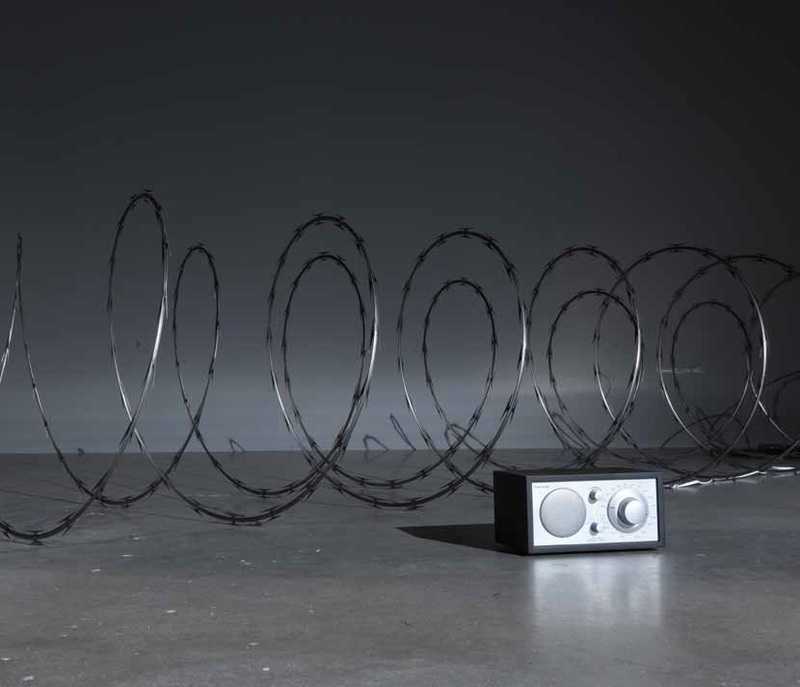 Bates transmits a signal through a long spiral of concertina wire (barbed wire with razor blades). The ambient sounds of the passersby perturb the wire, modulating this signal accordingly, and making the wire operate like a low-pitch microphone. The resulting hum, sober and somewhat threatening, differs drastically from the cacophony of voices rising from the bar in the rickety sailboat stranded in the museum’s foyer. Ship in a Bottle, Barbados Rhum (2011) by Dean Baldwin awaits the viewer like a treasure island of sweaty pleasure and free-flowing moonshine in the “bottle” of the museum, a comparatively prohibitive but necessary container. Alongside these obvious examples of “relational” art, the exhibition includes many artworks that initially appear resolute in their boundaries and indifferent to the viewer. In Chris Kline’s almost all-white paintings, for example, the reference to a self- or media-contained modern model of art making is blatant. His three large paintings on translucent poplin (Divider, # 1, 2, 6, 2011) bear subtle stripes of blue that shimmer briefly when seen from a particular angle and under particular conditions of light. As such they seem more responsive than Robert Ryman’s, for example, and less strict than Frank Stella’s pinstriped black paintings. Olivia Boudreau’s video projection L’Ètuve (2011) and Lorna Bauer’s installation of photographs, Èminence grise (Documentary Photographer) (2011) are similar to Kline’s paintings in this regard, each probing her medium and the viewer’s subjectivity simultaneously. Bauer’s very dark photographs of herself taking photographs in a very dark reflective surface are so dark that they recede into abstraction and near impenetrability. In Boudreau’s video, a sauna slowly fills with steam, obscuring the women then dissipating repeatedly. The steam has the effect of blurring the distinction between the video- and gallery-space. This prompts a rather cynical reading: viewers, like the women in the sauna, are in the fog (or perhaps, à la Bauer, they are left in the dark). Charles Stankievech’s video installation LOVELAND (2009-2011) takes medium-specific perception as its subject while also, like Boudreau, seeking to immerse the viewer and, like Kline, harking back to Modernist painting. It is a performance of Jules Olitski’s painting Instant Loveland (1968): in the snow and ice of the Far North, Stankievech ignited a smoke grenade, which sent a cloud of purple haze drifting across the white horizon. In order to facilitate immersion into the illusionistic space of the video, Stankievech painstakingly prepared the gallery room like one would a stage set: light-grey linoleum covers the museum’s hard-wood floor, making it look like the polished concrete of Chelsea’s prominent galleries, and white paint collects in the corners and under the bench like snow. A different approach to medium-specific perception can be seen in the work of Fabienne Lasserre, Ève K. Tremblay and Nelson Henricks, who each attempt to move between them. Tremblay, for example, recites by rote long passages of Ray Bradbury’s dystopian novel Fahrenheit 451 (1953) and humorously attempts to capture the “becoming-book” of immersed readers by photographing them reading (Jonathan Lutes Becoming Pale Fire, 2007, for example). Lasserre makes whimsical but modest artworks out of banal, indeterminate materials such as felt, fabric and paint. They are neither paintings nor sculptures but something other, like Unthought (2010), a large amorphous ball of painted linen set on an old vinyl chair. Nelson Henricks’ 2287 Hz (2011) makes a subconscious auditory experience visible. The installation consists of two rooms: in the first is a wall-sized (silent) video projection of an androgynous figure, a dancer, spinning in rapid circles; in the second are various objects that make the soundtrack for the first: a turntable, two video monitors, various speakers and two light bulbs perched on microphone stands. 2287 hertz is the frequency that corresponds with a 15 centimeter wavelength, the distance between two human ears. Sounds at this frequency are the most piercing, like police sirens, for example, and the wailing of a newborn baby. On the monitors we see a woman signing these sounds, while the spinning record makes a cyclic thud that sounds like it is coming from the dancer’s feet. Taken together, these various embodiments of 2287 hertz are, paradoxically, objective and poetic accounts of a subjective state. Overall (over-generalizing), despite the sheer quantity of artists included in the Triennial – more than 50 – and the vast variety of the artworks’ forms, this sampling feels pessimistic and repressed, as if daunted by the avant-garde movements it reiterates. Perhaps the “post” in Nicolas Bourriaud’s articulation of post-production has overreached itself, leaving the now and the future strangely in the past, as well as any hope the avant-garde held for social change. Thérèse Mastroiacovo’s large graphite drawings of the covers of art books featuring the word “now” (Art Now, 2005-ongoing) are aptly placed at the entrance to the exhibition: they speak to the art world’s compulsive effort to define the contemporary moment one tentative line at a time, smudgy and erasable. This entry was posted in Articles and Reviews, Exhibition Reviews and tagged Alexandre David, Art Papers, Ève K. Tremblay, Charles Stankievech, Chris Kline, contemporary art, Dean Baldwin, exhibition review, Fabienne Lasserre, installation, Lorna Bauer, Montreal, Musée d’art contemporain, Nelson Henricks, Nicolas Bourriaud, Olivia Boudreau, painting, photography, Rafael Lozano-Hemmer, Steve Bates, Thérèse Mastroiacovo, The Quebec Triennial, video. Bookmark the permalink.